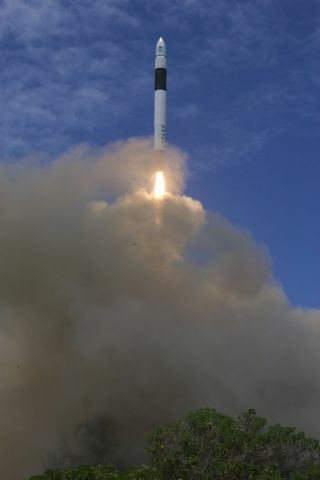 A SpaceX Falcon 1 rocket launches on the firm's second test flight on March 20, 2007. WASHINGTON?- A tiny weld defect discovered in one of the Falcon 1?s engine nozzles as therocket was being readied for a late June launch contributed to SpaceExploration Technologies? (SpaceX) decision to postpone its third attempt toput the rocket into orbit by at least a month. Elon Musk,founder and chief executive officer of the Hawthorne, Calif.-based rocket-startup, said June 27 that the defect was so tiny - about a tenth of millimeter -that it passed inspection before shipment and was unlikely to cause a problemduring launch. ?By ourcalculations and by our tests that should be safe for flight,? Musk said. ?However, in the interest of paranoia we are going to change the nozzle.? Musk said the weld defect wasdiscovered at the launch site in mid-June just prior to Falcon 1?s stages beingmated together in preparation for rolling the rocket out to the pad. SpaceX had been targeting a lateJune liftoff from the U.S. Army?s Reagan Test Site in the central PacificOcean. ArmyMissile Command spokesman John Cummings said Reagan Test Site officialsreserved June 24 to June 30 for a Falcon 1 launch from Omelek Island in theKwajalein Atoll and extended that window to July 3 before granting SpaceX?srequest to push off until late July. ?They came back to us and said they couldlaunch no sooner than 29 July,? Cummings said. Musk said theflawed nozzle can be replaced on Omelek, but requires moving the rocket backinto the hangar and de-mating the stages. ?We can do that a lot sooner thanJuly 29 but the problem is we couldn?t get a launch date after July 3 untilJuly 29,? he said. Muskdeclined to provide more detail about all that went into SpaceX?s decision toforfeit the late-June through early-July window he had booked for Falcon 1. Butin a June 25 press release announcing the successful completion earlier thatday a full launch dress rehearsal and hold-down firing, Musk was quoted saying,?we are definitely not tied to the clock for this launch, and we are checkingand cross checking every aspect of the vehicle and ground systems to ensure asuccessful mission.? SpaceX hasmade two previous attempts to put Falcon 1 in orbit. The first attempt, inMarch 2006, ended infailure about a minute into flight due to a fuel line leak and subsequentfire eventually traced to a corroded nut. During itssecond attempt, in March 2007, the Falcon 1 reached an altitude of 289kilometers and near orbital velocity before the rocket?s second stage engineshut down due to a roll control issue attributed to fuel slosh. The primarypayload for the upcoming launch is a smallsatellite called Trailblazer built on short notice by Poway, Calif.-basedSpaceDev for the Pentagon?s Operationally Responsive Space Office. ThePentagon had three candidate payloads for the upcoming Falcon 1 launch and heldoff until June telling SpaceX which one it had picked in order to test thecompany?s ability to integrate a payload with the rocket with just two week?snotice. Musk said the Trailblazer wasintegrated on time along with two smaller NASA-provided payloads providing thequick turnaround time the Pentagon wanted SpaceX to demonstrate. Explaining the decision to fall backto a window that runs July 29 to Aug. 6, SpaceX said in its June 25 pressrelease the Reagan Test Site would be closed for the U.S. Fourth of Julyholiday and resume operations July 24. Two days earlier, the Web site SpaceflightNow reported critical range assets were booked through July, attributingthat information to Musk. OneKwajalein official told Space News the range would be open and availablethroughout July with no launch activity on the schedule ?unless there?s a blackprogram going on that I don?t know about.? Cummingsconfirmed that the range would remain open throughout July, but said he did notknow whether it is available to SpaceX sooner than July 29. ?We haven?t lookedbecause they did not ask for it,? he said. Musk saidSpaceX was mistaken to say the range would be closed in July. ?I probably usedthe wrong word there and should have said ?not available to us.? Maybe they arenot ?booked? and maybe they are not ?down? but they are not available us,? Musksaid.